Courtyards can be found throughout the United Kingdom. These private enclosures are mainly used today as attractive inns and public buildings. 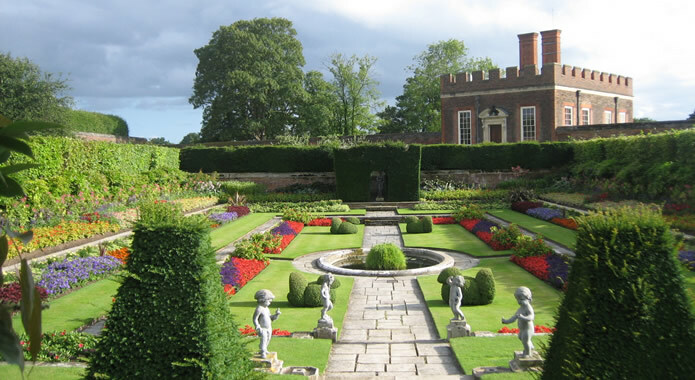 English courtyard gardens are some of the most popular attractions that you can visit in the UK. Some of the most notable courtyards are found as part of stately homes across the country. To continue to preserve the architecture and beauty of these stately homes and their gardens, many of these homes are now operated by the National Trust and charge admittance fees to those wishing to view the properties. Here’s the countdown of the top ten most popular English courtyard gardens, going from ten to one. These aren’t the oldest gardens or courtyards that you’ll find in the UK. Originally designed and constructed almost thirty years ago, Lamorran House Garden, has been featured as one of the BBC’s top 10 Gardener’s World Great Gardens of Cornwall. It’s obvious why it was chosen. You’ll find it on the Roseland Peninsula where it overlooks St. Anthony’s Head. It houses numerous plants from the Southern Hemisphere and the Tropics. This manor garden is steeped in history. The gardens were created from the designs of Mary Anne Disraeli, the wife of former Prime Minister Benjamin Disraeli. Much time and love has been invested in the restoration of these walled gardens over the last few years. There is also an expansive orchard within the grounds. So you can enjoy a crunchy apple or juicy pear whilst you look out across the mesmerising views of woods and parkland that surround the walled Manor. If you have an interest in British history, make sure that you take the chance to visit what was once the peaceful retreat of one of our county’s former leaders. Built around the ruined 18th Century Castle Kennedy, this is a huge expanse of land. As well as the various courtyard gardens, you’ll also find a number of wooded areas within the grounds. The courtyard gardens are at their colourful best during the summer months. You’ll also find an enchanting and almost unbelievable two acre lily pond, that’s home to a number of interesting creatures. This is a perfect place to take your children to. They have a number of year round activities that your child can enjoy some age appropriate activities whilst you enjoy the landscaped finery. Designed by royalty, this Italian inspired house and gardens is visually spectacular. It has been fully restored to its former Victorian glory. Queen Victoria’s children laid their own hands at gardening within these walled gardens. The gardens still feature the exotic plants that were popular in these impressive gardens during the Victorian period. All of the flower beds are changed seasonally, so whenever you visit, you’re sure to see something new. If you visit, be sure to pop into the adjoining Swiss cottage too. These courtyard gardens feature gorgeous views of chalk lined valleys and rivers. It also features an early twentieth century Japanese garden within its walls, alongside early Italian architecture. You won’t find any exotic plants here, but you will see a selection of Britain’s finest plants. It’s a wonderful trip to take, but those looking for a day out with a spot of lunch will be disappointed to learn that Haele Garden doesn’t allow picnics within its walls. If you are peckish during your stay you can take advantage of the newly installed tea house. These courtyard gardens were created during the late eighteenth century by the second Earl Varney. The walled garden sits behind the Claydon stately home and is rather expansive, sitting across two acres of land and has been redesigned by each generation of the family that has since taken over the land. The current occupiers have added a pool garden, and restored its nineteenth century greenhouse to almost pristine condition. The grounds will no doubt continue to evolve over the years. The gardens are housed within the moated Mannington manor house. The courtyards house various different kinds of roses. Each garden has been specifically designed to reflect a different era, from the 15th century to now. One of the more interesting courtyards is found on the garden’s south lawn and is a temple of sorts. A visit to Mannington Gardens is essential for anyone who loves rose gardens. Trengwainton Garden features a relatively modern collection of 20th century walled gardens. Within the walls you’ll find a large collection of UK native plants and also a number of more interesting exotic flowers, some of which you may never get to see in the UK. Be sure to visit during the summer months, as there are also gorgeous terraces and summer houses. This is the ideal location for a summer walk. Covering 10 acres of land, these gardens are frequently referred to as one of the UK’s most exciting garden projects. The courtyard gardens feature Elizabethan architecture and the grounds house a vast selection of unusual and rare exotic plants. The entire portion of indoor garden has been constructed within the ruined courtyard of the original grounds. It also features a parapet walk and cloister. This is a truly beautiful area of landscaped garden and great British architecture. These are some of the most beautiful and impressive gardens in the United Kingdom. Steeped in history and built during the late medieval period, they cover over a thousand acres of parkland. They have some of the most visually impressive courtyards that have ever been designed. They include a number of areas that showcase plants from various countries and areas so that each garden reflects a particular era of time. This venue is also available for hire. The beautiful courtyards would make perfect venues for weddings, christenings, tea parties or whatever event you could imagine using it for. These courtyard gardens are fantastic places to visit. A walk around any of them won’t just provide you with a great day out, they could also provide you with much needed inspiration for your own courtyard garden.